Welcome to Buchan's Kennels and Structures! 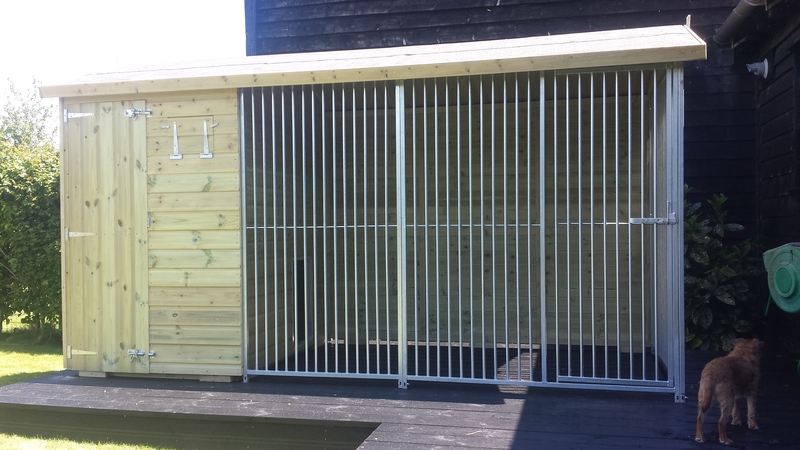 We specialise in manufacturing and supplying "Ultra" Quality Professional Kennels. We manufacture all of our kennels ourselves in the UK. Buchan's Kennels and Structures strive to offer both value for money and high quality products for both the professional and domestic user. Our dedicated sales team are on hand to offer you the best advise and personal service that all our customers receive and deserve. Our commitment to customer service is second to none, helping you with your specific needs..
We deliver throughout mainland Britain and our delivery costs are clearly stated alongside our products. For our larger kennels we deliver and install our kennels ourselves. Delivery times for different products vary, our kennels are made to order in our UK factory and are usually installed at your property within 2 weeks of our receiving your order. You can pay us online via our secure checkout or over the phone if you prefer. What size dog run do I need? The quickest answer to this question is to build the largest dog run that space and budget can afford. There are never any benefits to your dog by having a smaller dog run so there will always be trade-offs when deciding what size of run to go for. Remember to bear in mind added how long your dog will be spending in the run before making your decision. Remember to allow some space in your dog run for a sleeping area or dog kennel and always have water, toys etc. in there. It is worth bearing in mind that your dog may also soil inside the run. 8cm bar spacing: The vertical bars within the panels are spaced 8cm apart. These panels are the most popular and cost effective option and are suitable for most dogs except the very small breeds and puppies. If the gap between the bars is too wide for your young puppy, some of our customers have used chicken wire around the lower part of the dog run for the first few weeks until the puppy has grown. 5cm bar spacing: Kennels tend to choose these panels as they is suitable for the many shapes and sizes of dogs that pass through their doors. Dog runs with these panels are particularly climb resistant. 50mm x 50mm Mesh: The mesh panels are ideal for those of you who don’t want to take any chances. They are made from 4mm welded mesh and are often the best solution for and small dogs or if you have a dog that is aggressive. Solid panels: These dog run panels are filled with ridge profiled coated steel sheeting and are useful in parts of a dog run where you need to form a screen eg. against a neighbour's property or where you need to create a wind break. These panels also have good noise reduction properties if barking is a problem. 3/4 mix panels: These panels are 3/4 ridge profiled coated steel with the top 1/4 being either bars or mesh. Like the solid panels, these 3/4 panels are also useful in parts of a dog run where you need to form a screen. Our dog run panels can be formatted any way you want. You can bolt them together to make a rectangle dog run or maybe a more elaborate shape to suit your requirements. You can also use them alongside an existing building like a house, garage etc. as part of the boundary of the dog run - this will save you money on dog run panels and will make better use of any space you may have. Every dog run must provide some protection for your dog against the elements and in particular the sun. The best solution is to have a roof . Our roofs are coated steel ridged sheeting that can span up to 2 metres without further support. They are intended to overhang the outer edge of the dog run by 25cms to allow rain water to run off. Our customers tend to prefer the aesthetics of a roof that runs from the front of the run and drops down towards the back of the run, ensuring that the rain water drains off at the back of the run, preventing the front of the run from getting muddy. If you are considering leaving your dog in the dog run for more than a couple hours day, then you need to provide him with a sleeping area so many of our customers put a dog kennel inside the dog run. You need to keep your dog run clean and hygienic as this is paramount to the health of your dog. Surfaces like grass or gravel cannot easily be cleaned and are therefore a health risk both to your dog and to you. These surfaces can also quickly become muddy and soiled. The best surface is concrete as this allows you a uniform platform that is easily cleaned. Paving flag stones can also be used but it is recommended that the gaps between the slabs are properly pointed with cement to prevent them being a soil trap. It’s a good idea to build the base about 6" larger than the dog run so that the weight of the run does not sit on the edge of the base which would make it prone to cracking.